In Today’s Revolutionary Internet Age, Marketing has taken a new direction unto a bigger scene which is easily accessible to anyone with internet access via PC or Handheld devices. 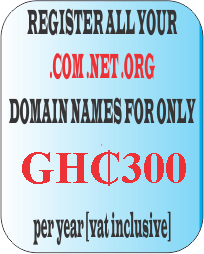 Since 2006 we have kept our brand soaring high as Ghana's second to none Web Services and Digital Marketing solutions provider with services ranging from Domain Name Registration, Web Hosting, Website Development, Bulk SMS, Internet Marketing and more. In 2010 we added Bulk SMS to our services and named it TextGhana.com; TEXTGHANA.COM™ is web-based platform designed and developed by us to forward mobile SMS messages. It allows for messages to be sent to a large number of mobile users, known as bulk mail messaging and also sends to a single individual user. All users do is to visit www.textghana.com and Sign Up for an Account, and get 5 FREE SMS to test the platform. SMS messaging is the only medium that enables instantaneous notification of a targeted group of people, regardless of their location! Silky I.T. Production is using Digital Marketing to grow many businesses in Ghana by identifying the right target audience and providing them a huge exposure via Website Creation, Bulk SMS, Facebook Advertising, Twitter Advertising, YouTube Advertising, Website Advertising, etc..
FREE Website Software i.e. Wordpress, OSCommerce, etc..